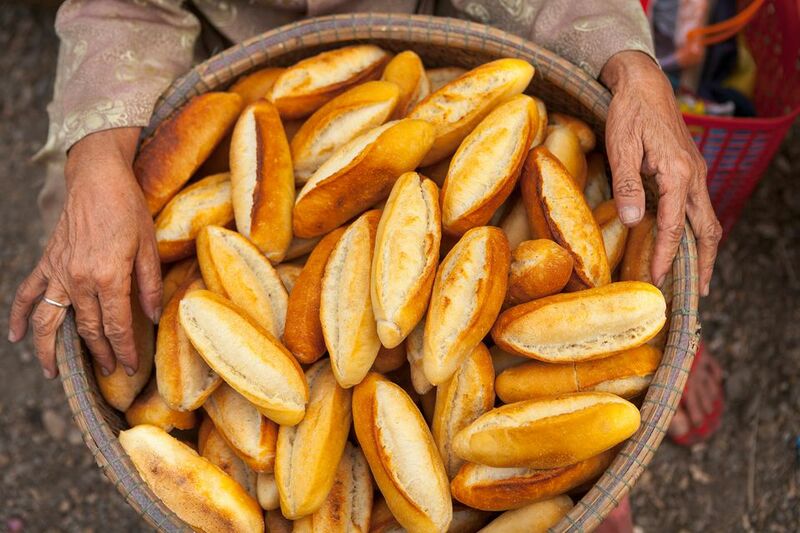 What makes the Vietnamese baguette different from its French ancestor? The Vietnamese baguette is not called baguette in Vietnam. It is banh mi, the generic term for bread, although the English-speaking world knows banh mi as the ubiquitous Vietnamese sandwich. The bread with which the banh mi sandwich is made is one of the many legacies of France which was once Vietnam's colonizer. To the uninitiated, the Vietnamese baguette may simply look like a smaller replica of its French ancestor. It is not. The Vietnamese baguette is lighter, airier and the crust is thinner, lightly crisp and crackly. Banh mi is inexpensive and so widely available in Vietnam that even sellers of banh mi sandwiches rarely bake their own bread. But for those who want to try their hand at making Vietnamese baguettes at home, a few pointers will definitely help out. There are many theories as to how the Vietnamese baguette acquires its unique texture. Some are facts while others are not. Many people make claims that rice flour is mixed with bread flour to make the banh mi dough. This claim is false. While some recipes do include rice flour, not all of them do and they all seem to have the same signature texture. As you explore banh mi recipes, you'll find that many simply use all-purpose flour while others do combine it with rice flour. Very few use bread flour or other types, so that is not a requirement either. Another common claim is that the dough must rise at a specific temperature. This is true in the sense that the rising time is directly affected by the room temperature. It's something that all bakers have to contend with for yeasted bread and rising times will often change with the seasons. Dough rises better and faster in a warm environment. If your kitchen is cold, you can try to heat the room or leave the dough to rise in the warmest area. Ideally, a room temperature of 70 to 77 F should be the goal, but that can be difficult to regulate in some kitchens at certain times of the year. To make it easier and do this on a small scale, you can place the shaped dough inside the oven and put a bowl of steaming water underneath. Close the oven door tightly so the warmth is trapped inside. For the Vietnamese baguette, there is a specific way to shape the dough. It isn't enough that the dough is formed into a log and this particular shape may contribute to the texture. Many cooks who have tried baking Vietnamese baguette say that the dough must be flattened then rolled jellyroll style, before rolling into a log with tapered ends. Others flatten the dough then fold it like a big envelope before proceeding to form it into a log. In addition to the three items above, if you want perfect baguettes, you'll need to add steam to a very hot oven. This is probably the final piece to the puzzle and possibly the true key to the bread's success and appeal. Unlike many bread recipes, which use an oven temperature around 375 F, these baguettes must be baked at a high temperature of 450 F. It's also crucial to place a bowl of steaming water underneath the loaf. Additionally, the loaves should be lightly sprayed with water two to three times during the first half of the baking time, which is typically 30 minutes. If you forget these final tips, you'll have a nice baguette, but it will not be banh mi. The sprayed water helps crisp up the crust and it's possible that the steam affects the bread's airiness.